- Mix the goat cheese with the dried cranberries and the pistachio pieces. - Add a thin sheet of plastic foil over a small round bowl. This will help flip the spread over more easily. - Place the pesto on the bottom of the bowl (over the plastic foil). This will be the top layer of the spread. - Add the sun dried tomatoes on top. This is the second layer. 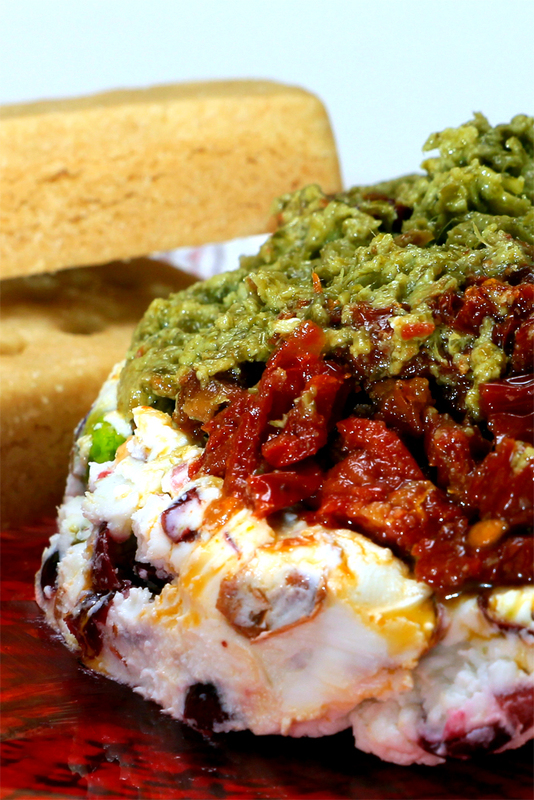 - Roll the goat cheese mixture into a cylinder shape, and place it over the sun dried tomatoes. Press the cheese mixture gently for a uniform spread. Make sure the tomatoes are thoroughly covered by the cheese. - Place the bowl in the freezer for 30 minutes. This will help flip the spread over more easily. - Remove the bowl from the freezer, and flip the spread over in a clean plate. Gently remove the plastic foil. Remove any stubborn pieces that stuck to the plastic foil, and carefully place them back on top of the three layer spread. - Let the recipe reach room temperature again (about 20 minutes).